This paper discusses about the Here Comes Honey Boo Boo and Wife Swap Summary. Wife Swap is an American reality based television program, in which two families of different status and different background swap their partners. Mostly wives/mothers swaps in this show but sometimes husband/fathers also. In this show, family is introduced with new family member, which may be or may not be suitable for the family. For example, a husband can exchange his messy wife with a neat one. Due to this show many family realize the importance of their partner and children. The families who watch the spin-off series also learnt lesson. The program was first broadcast on ABC channel in 2004. 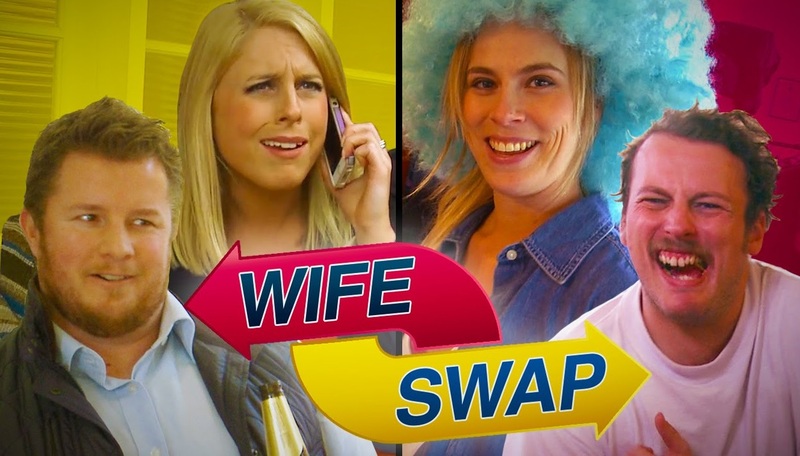 The first season of Wife Swap on aired from January 2012. The second season of Wife Swap was deputed on February 26, 2013. Season 3 was on begun from April 15, 2011 and season 4 was on premiered on May 20, 2015. There were wife swap of 5 celebrities in 1st season, 9 wife swaps in 2nd season, 13 wife swaps in 3rd season and 13 wife swaps in 4th season. The episode I have watched of wife swap, Nigel and Darren in 2003. In an episode husbands were swapped, there were two families. Darren and Alexandra who were together from 2 years and have one child, and Nigel and Marina who lived together from years, they have seven children. Darren and Alex had 5 dogs and 10 years old child, while Nigel and Marina had 7 children, who were 17,14,14,12,7,6 and 2 years of age. According to the Darren, Marina is a luckiest and laziest woman. Both the families have different life styles, Darren do not work at his home, while the Nigel have to work and cook because of his 7 children. Nigel love to do household tasks. He does cleaning and washing as well, he loves to serve his family. Nigel’s wife Marina does not like to do household tasks, she earns for family. Alex is a perfect wife who earns, cook and take care of her child. Darren does nothing at home; his son does washing and cleaning, so it was difficult for him to manage household tasks like cooking at Marina’s home. The situations in the episode, are seems to be real, they may dramatized some situations to attract the views and to get fame. Darren was facing difficulties at Nigel’s home because he was not used to doing such things, he cried in such situation, he may be dramatizing, but he may be really fed up from routine there. He has conflicts with Marina; as well, that she does not do anything. On the other hand, the Nigel was doing all the work of home as he was used to managing the tasks. He cooked the food and did the cleaning of home, but Alex was not happy with him. All the situations in the drama were exaggerated. The kids of Marina did not like the food and they were not satisfied. As they, all know that camera crew is following them so they made the situations overstated; moreover, they were behaving in their own ways. Marina got up early to see her kids, as she never got up this much early. Darren was making the rules in the house, to sleep early. Nigel cleaned the home and was doing fragrance spray in home, as they were not human being and was dirty people. All the situations were dramatized. In this particular episode, there were so many situation, which were not, seems to be real like when Nigel cleaned the house very nicely, everything was so neat and clean. The reaction of Alex was not real in this situation, she should be happy that he cleaned the house but she said he spoiled her mood. In addition, when he said that dogs should not be kitchen then she replied she likes them kitchen. This was really seems staged because everybody like cleanliness. Moreover, when in a bad mood Marina was taking care of her kids and cooking food for them, she was reacting so badly. It was also staged because if she have 7 kids then she should look after them there is nothing to feel bad. This season reflects the stereotyping of American culture, which is apparently different from the other cultures. The cultural of wife swap is not acceptable in some societies. Muslim culture is strictly against it, that why spouse is given to somebody else. It reflects American stereotypes, as Marina is a fat, lazy women and have the ignorant behavior, she do not look after her children. They are using nasty and abusive language, which may not acceptable in every society. Men look after household task and women are bread earners, this is also stereotyping of American and Christian culture. Here comes honey boo boo is a American reality based television series, in which main character is Alana as ‘Honey boo boo’, she was 6 years old when she started season 1. Thompson and her real family got fame through this reality show on TLC’s. This show was based on family adventures. The show takes place in southern town, McIntyre, Georgia. The first season of honey boo boo on aired from August 8, 2012 to October 26, 2012 and in 2013, it is followed by four special airing. The second season of honey boo boo on aired from July 17, 2013 to September 11, 2013. Season 3 was on aired from January 16, 2014 to March 6, 2014 and season 4 was on aired from June 19, 2014 to August 14, 2014. It was on aired from LTC’s TV. It had 10 episodes in 1st season, 12 episodes in 2nd season, 12 episodes in 3rd season and 14 episodes in 4th season. It had total 48 episodes. There were seven family members in Honey boo boo family, Alana Shannon (Honey Boo Boo), June Shannon ‘Mama June’ the mother of Alana, Mike Shannon ‘Sugar Bear’ he is a chalk miner, her 3 sisters, Lauryn Shannon ‘Pumpkin’, Jessica Shannon ‘Chubbs’ , Anna Shannon ‘Chickadee’ and one little baby girl (daughter of Anna Shannon) Kaitlyn Shannon. The episodes from series ‘honey boo boo’ is based on reality, they have shared situations of their real life, the series got fame in America, the reality based television series reflect the culture of rural Georgia. This series were over dramatized, just to get fame and attract the audience. It attracts about 3 million viewers. Viewers also do critics on the series that, this type of series should not played on social media; America is promoting incorrect and spiteful series. This show is exploitation; TLC should not play the show. The family is fun loving and criticize each other followed by jokes. The situation shown in the show can cheer up anyone; however, there were misuse of language. Mama June does not give importance to the Sugar Bear in some scenes. Sugar Bear loves Mama June a lot. Love is shown in the family members; real situation was shown in the episodes. Camera crew was around them, but it does not matter for the family, they continued behaving in their own way and styles. People of America and other countries get inspired from the some characters of the series, which was the reason of it success. The camera was following the family because the family was interesting, the stories related to them seems real. Baby Mama not trusts Sugar Bear because according to her, he cheated her so many times. The interesting scandal of child molestation, the child of Anna, interesting marital issues and dirty secrets of family seems interesting to media; media want to know the secrets and judge the situation that the situations are true or not, consequently camera crew was around them. Nevertheless, later on TLC announced for the cancellation of the show after many reports because it was also promoting illegal behaviors. I have watched the episode ‘Chubby Chaser’, this episode may not be real, in this episode June was convinced by the Sugar bear to marry him but Mama June don’t want to marry because in her family there is big ratio of divorces, no couple live happily, but Sugar bear love her so he put the ring in her hand. She agrees and did commitment that she marries to him. Everybody was exited for the wedding then and started making plans. In this episode may the Mama June agreed for wedding, just to show the audience, because she do not trust the Sugar Bear. Nobody can explain the original feelings of the character so we cannot be judgmental. Although, after considering the episode they both are looking happy after they had decided to get married. This season reflects the stereotyping of African and American culture, which is apparently different from the others, culture. The people are really loud, friendly and talkative. There have very friendly environment at their home; they are talking freely at every aspect. Even the Honey boo boo is very talkative and smart. They are fat, as this is the American stereotype because they want spent luxurious life. They love eating food like other Americans, as the Mama June is comparing her ring with sausages. They are creative and dressed up nicely. Ignorance is also stereotype of Americans, as Mama June is ignoring the Sugar Bear it reflects the ignorant culture in society. They also reveal African culture as if they are much civilized, they are not intelligent and they are lazy somewhere, and not participating attentively.